Source: 32-34° F. Keep cold. Mist occasionally. Nutritional: Carrots are an excellent source of beta-carotene, which our bodies turn into vitamin A.Vitamin A is very important for good health, especially for your eyes. In fact, vitamin Ais so important for your health that you should eat fruits and vegetables packed withvitamin A every day. Carrots are one of the best sources of vitamin A. 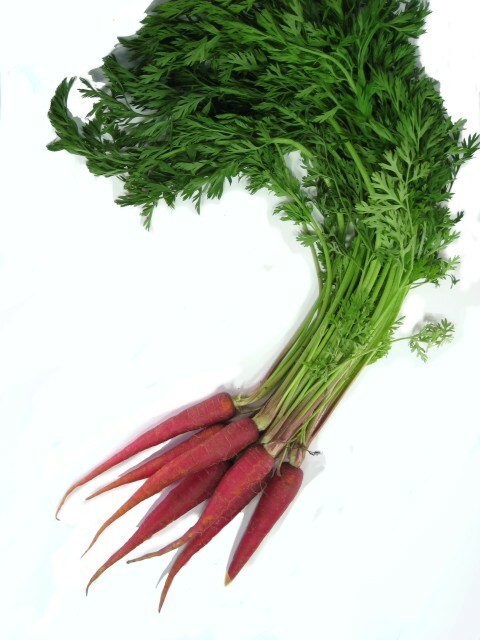 The red carrots, in particular, contain the carotenoid lycopene, famous for preventing prostate and other cancers. Applications: Maroon carrots can be used in any carrot recipe, but if left raw, either shredded into a coleslaw or dipped into a garlic mayonnaise, the colours, flavour and texture really shine. You will find maroon carrots sweeter and a touch crisper than their orange cousins. History: The noble carrot has long been known as an orange vegetable. Generations of people in the West have grown up believing that carrots are always orange. But as long ago as 2000 BC temple drawings from Egypt show a plant believed to be a purple carrot. It is also identified in the garden of the Egyptian King Merodach-Baladan in the eighth century BC.